At the end of our last update, we said that there was to be a treasure hunt. Well we did have one and must say that Paul and Mal (from LAZY HERON) put a lot of work into it. The theme for the day was pirates and was suggested by the Old Lock's answer to the "Chuckle Brothers", Daniel and Callum Bailey. 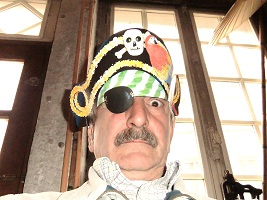 As Paul said "The French must think we are quite strange" running around in silly hats etc. What do you think? 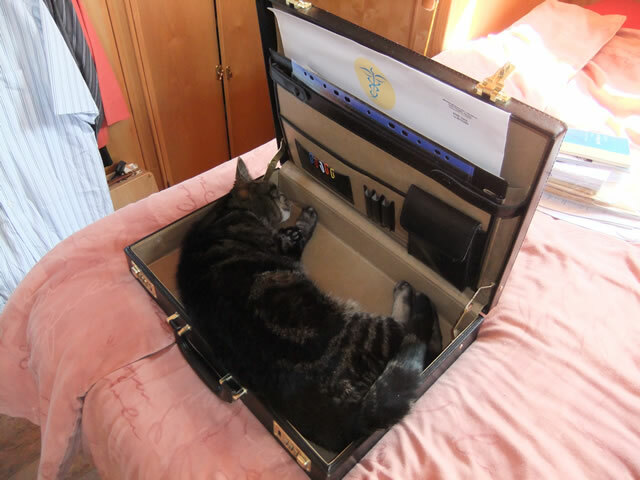 Pamela was just going through a few documents the other day and left a briefcase open. As you can see, it didn't take Gromit long to check out the possibility of using it as a new bed. The weather started to improve and that always means BBQs. Of course we can't get to them all, as we are cruising during some of them, but we did manage to get to this one at Steve's. 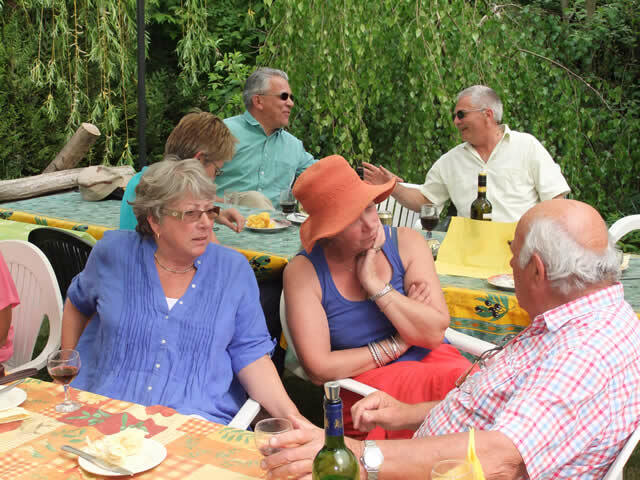 Always well attended with good company and the perfect way to catch up on what we have all got up to during the winter. 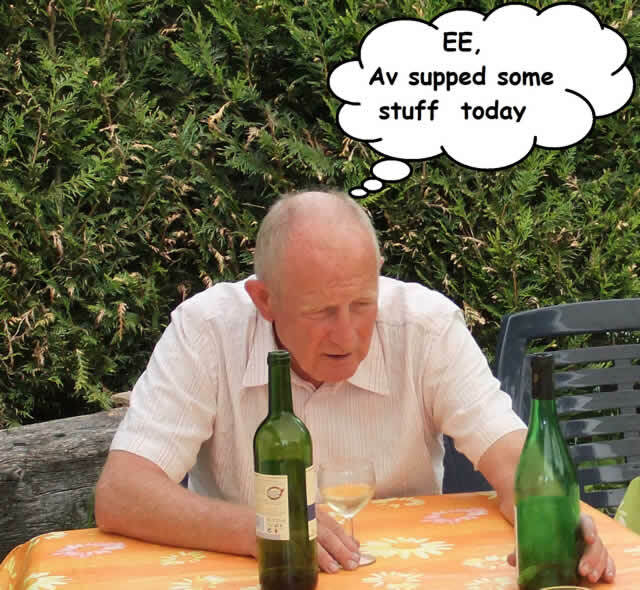 No apologies for the next picture - simply couldn't resist the caption - sorry Paul!! Two of our friends, Jean-Albert and Jacky, left their home up here and went to live down in the south of France. They now live up in the Montagne Noire area which feeds the Canal du Midi. We wish them all the best and hope to visit them one day. Always good company and, as they say, "our loss is the South's gain". C'est la vie! Another BBQ and this time, a little nearer home. At Ilse and Jean-Pierre's house in fact. 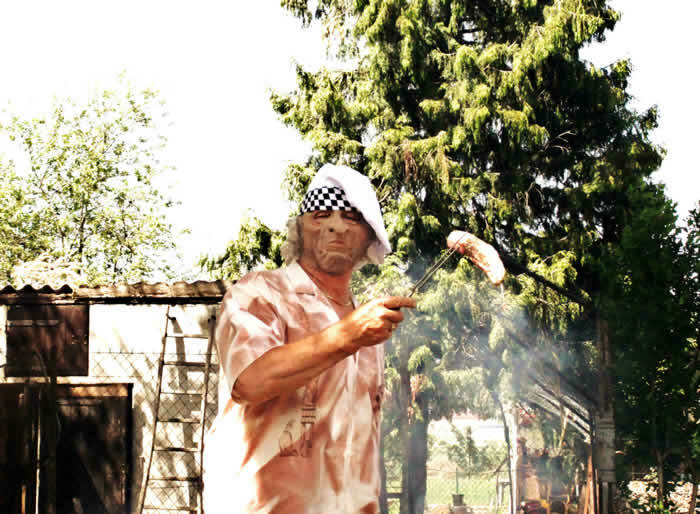 As you can see, the celebrity chef is quite unusual. 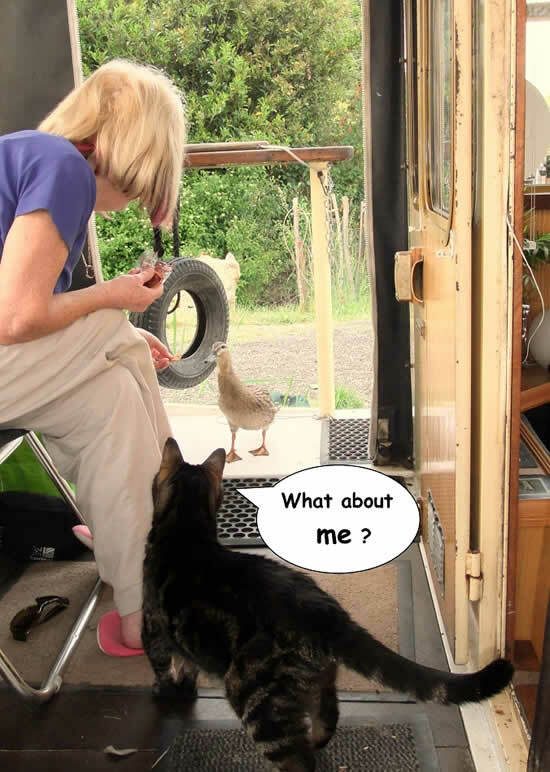 But we put up with him because his food is 1st class. We both decided this spring that we were in need of new glasses. But forgive me for wondering, or making a spectacle of myself, why do we still call them glasses? If you go into an Opticians and ask for glass lenses, they seem to get into a panic. I was once told "nobody wants glass lenses anymore!". Well "I do"! If I wanted plastic ones I would say "please could I have a pair of plastics". But I think that would confuse them even more. Pamela's sister Pat came over to visit at the beginning of May and we weren't sure if being at our winter base would be as good as if we were out cruising. But as it turned out, we had a great time with plenty going on. Now Pat has been here quite a few times and she probably knows as many of our friends as we do. But trying to have get togethers on our boat with everyone would have taken up most of Pat's holiday. Jean-Pierre and Ilse kindly said that we could use their garden if we wanted to invite people around. So we decided to have a little afternoon get together with about 20 people. It really worked out well and was a great afternoon. Another day (the day after Pat's birthday to be precise) we took Pat up into the Jura region and said that we would find somewhere nice to have lunch. 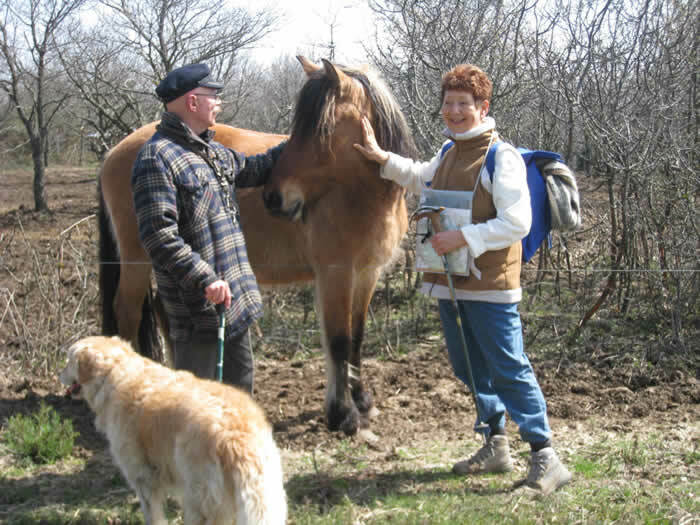 What Pat didn't know was that our friends, Pim and Karen, had already invited us to have lunch at their farmhouse. So we decided to keep this as a surprise for Pat. 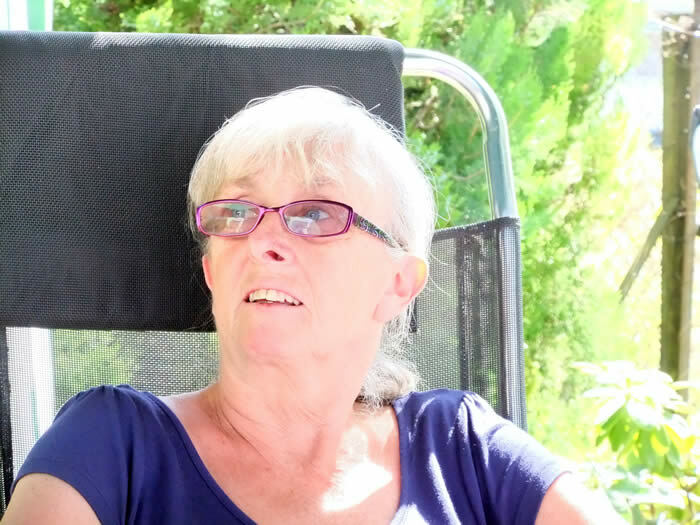 Once we were in the Jura, Pat couldn't understand why we only stayed for a drink at a very nice restaurant, when everyone else was staying for lunch. Whilst we seemed to be driving around aimlessly in the middle of nowhere. Actually we were early and didn't want to spoil the surprise. As we entered the farmyard, Pat was starting to feel uncomfortable. It didn't look like a restaurant and the thought of trepassing was going through her mind. Pim and Karen, knowing that Pat had no idea where she was, kept out of sight, peering through their windows until we got out of the car. Surprise, shock and huge relief as Pat's smile appeared. What a fabulous afternoon we had with wonderful food, great hosts and a beautiful setting. Many thanks to Pim and Karen. One of Pamela's latest culinary creations is something she picked up from a Tesco recipe card. It is called "Tray baked salmon" and is very nice too. There were a lot of ducks mating in the canal around Lea Crest during May and the females seemed to be quite courageous, taking food from anywhere. We don't think Gromit was over impressed with our visitor. 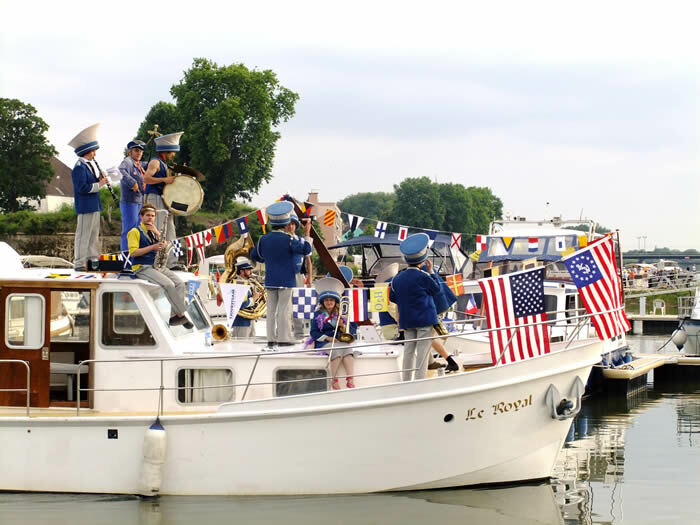 The big event this year was the opening of Port Royal, a new port further up the river at Auxonne. Not the sort of project you would expect a company the size of H2O to take on. But they did take it on and we are sure that it will be a great success. The opening was well attended and the weekend went very well. A good start to the cruising season. We spotted the cows in our next photo on the way back from Auxonne. It seems that they like to live dangerously. We aren't cruising very much this year as we think the boat is looking a little sad and would be improved with a coat of paint. 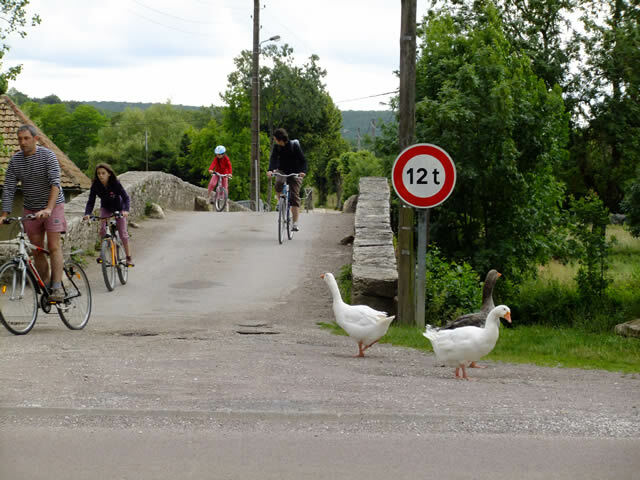 One of our favourite parts of the system is Pont d'Ouche on the Canal de Bourgogne. So this is where we decided to spend the summer, doing the necessary work. 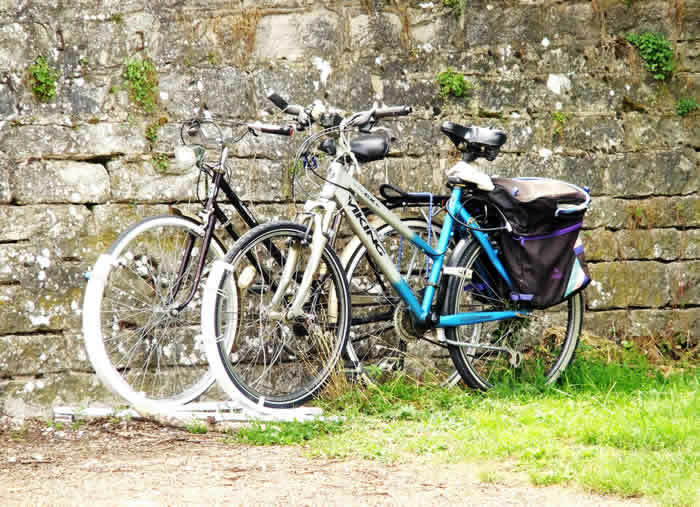 There are quite a few pretty villages on the way up to Pont d'Ouche and we decided to stop over at some of the villages that we would normally just pass through. One such village, St. Marie sur Ouche, had a canoe-oing weekend going on while we were there and the security at the bridge crossing was manned by some of the locals. The property in our next photo looks as though the owners like to keep warm in the colder months. You wouldn't want to pay the annual chimney sweeping bill though would you? Last winter some friends back in St. Jean de Losne (Roger and Jenny) were raving about the virtues of Fray Bentos tinned pies. Now that brought back some happy memories of just about 40 years ago. We had just got married and our repertoire of culinary skills was, to say the least, very poor. Pamela's claim to fame was sausage and mash. Mine was a bacon and melted cheese sandwich. 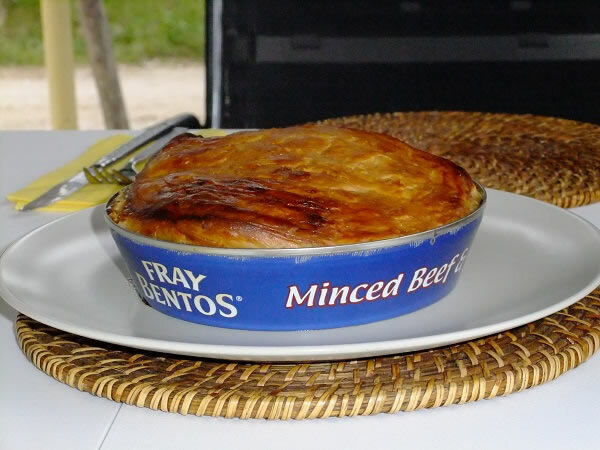 So until we had a few more recipes up our sleeves, Fray Bentos pies seemed to be sheer luxury. We managed to acquire some from England and share them with Roger and Jenny. Another place we had passed through many times but hadn't stopped at is Veuvey sur Ouche. 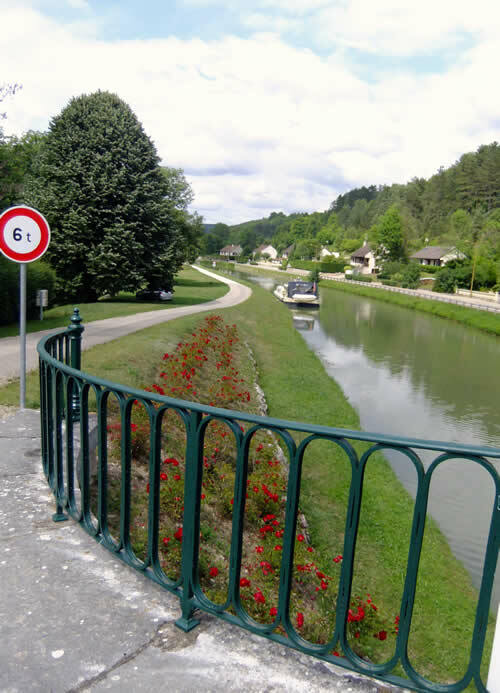 It's only 3 locks away from Pont d'Ouche and is a pretty village with a nice grassy area for Gromit. Next stop Pont d'Ouche, where we intended to get away from it all and stay for most of the summer. But no sooner had we arrived than we had a phone call from our old friend Jean-Claude. 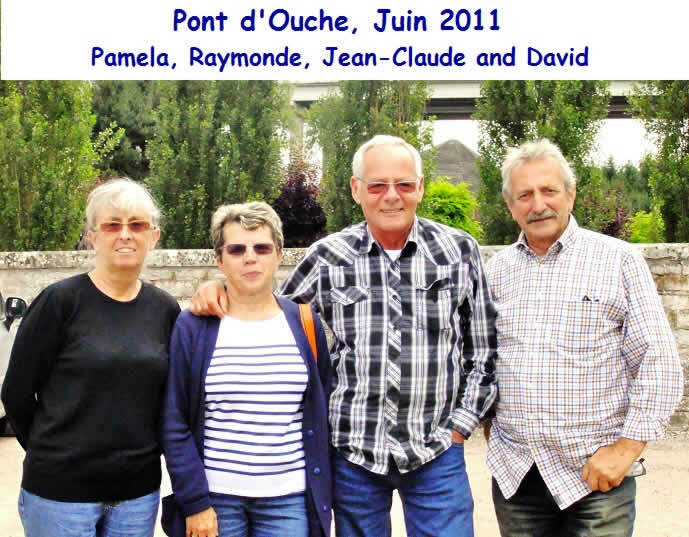 We met Jean-Claude and Raymonde in about 2007 (we think) when Jean-Claude was fishing by our boat and they were on a short trip from where they live in Beaujolais. 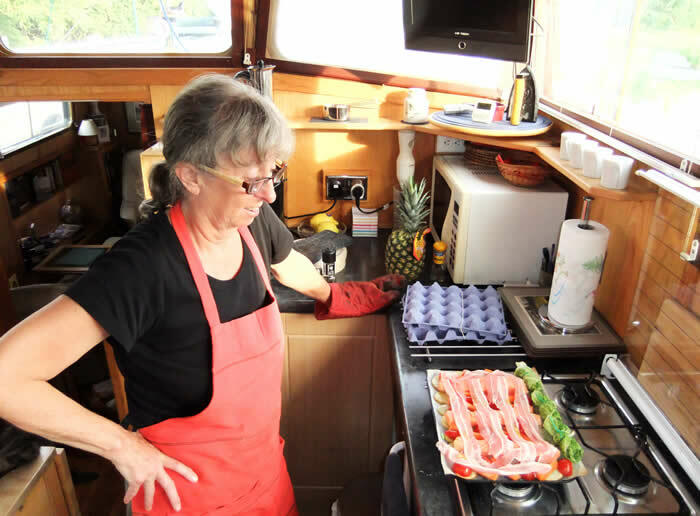 They have a camping car and through Jean-Claudes fishing have made many friends amongst the boating community. We don't see much of one another on a regular basis but we do enjoy a get together when we can. Always good company with a nice meal or two thrown in. Jean-claude is a keen gardener too so often brings us some great fresh vegetables. Another friend (Philippe) had decided this year, to move his boat from Pont d'Ouche to Crugey, a village about 3 kilometres away. Philippe is more or less self contained and can make a battery last for about 6 weeks. His fridge runs on gas so he really has no need to be hooked up to shore power. He spends his winters in St. Tropez, where it is generally a little warmer than living aboard on the French canal system. 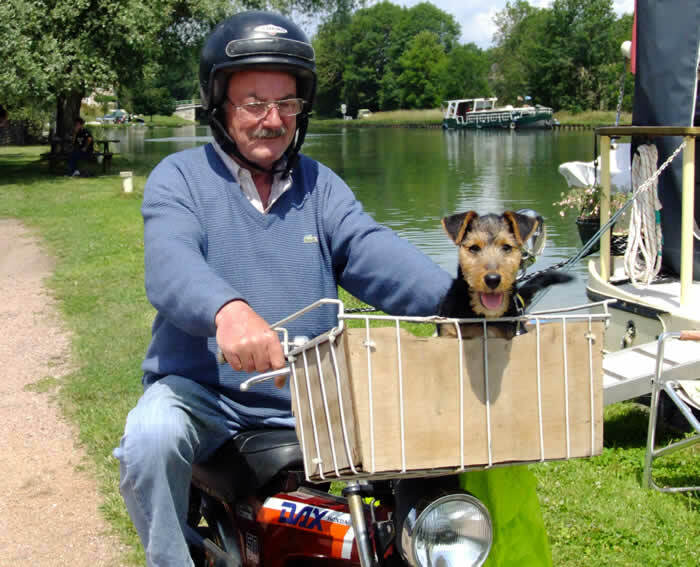 His latest acquisition is "Ma Cherie" a cute little fox terrier puppy and most days they can be found exploring the Cote d'Or on his little Honda Dax motor cycle. As you can see, the freezer basket seems to be a perfect size for the dog. We decided that Wednesday would be our shopping day as although we have our car with us this year, we don't intend driving around all the time. We take an electric cooler box (plugged into the cigar socket) and that keeps everything cool. It also allows us to spend a little of our shopping day exploring the area on our way back to the boat. In fact on one occasion we kept the cooler box running for about 6 hours with no effect on the car starting. I went for a walk the other evening, just trying to get a better picture of the house opposite the port. 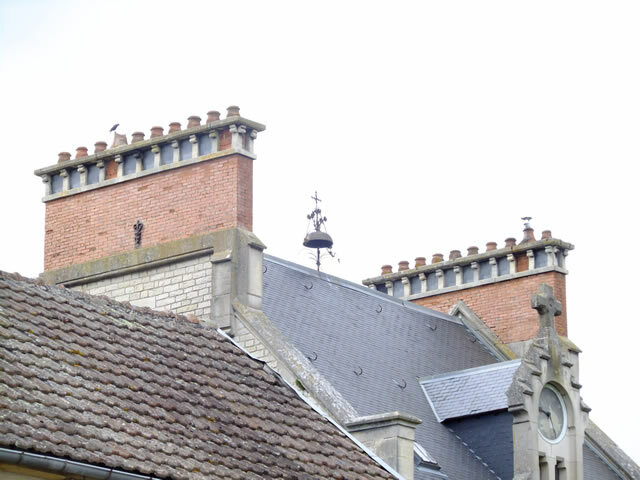 It used to be a factory that made either bricks or tiles with it's own short embranchment onto the Burgundy canal (Canal du Bourgogne). It's a very pretty setting and the embranchment is part of the property's garden. But there was so much thickness to the hedge, I couldn't get a decent picture of the property. Just about then, a fancy looking Land Rover pulled up and I could tell that I was going to be asked for directions. My first line of defence is always that my French isn't up to much and muttering "I don't have my reading glasses either" usually gets me out of trouble. But the chap looked familiar and when, in an English accent, he asked "where are you from then?" the voice seemed familiar as well. Now, if this had been Chalky White from the Daily Mirror, I could have been £5 better off by now. 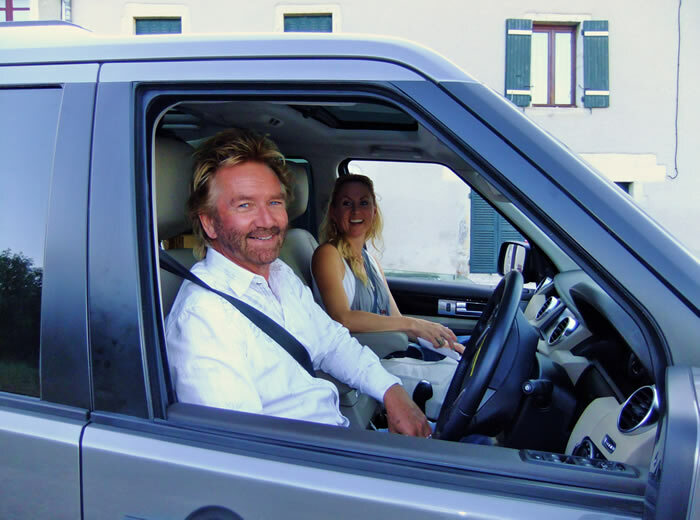 But of course it wasn't Chalky so instead I asked the man "are you Noel Edmonds?" to which he replied "Well, I was when I got up this morning". Although Noel and his wife were in a hurry and, as he said, "starving" they did kindly give their permission for me to take this picture for the website. So here it is and I must say that Noel looks very well indeed! 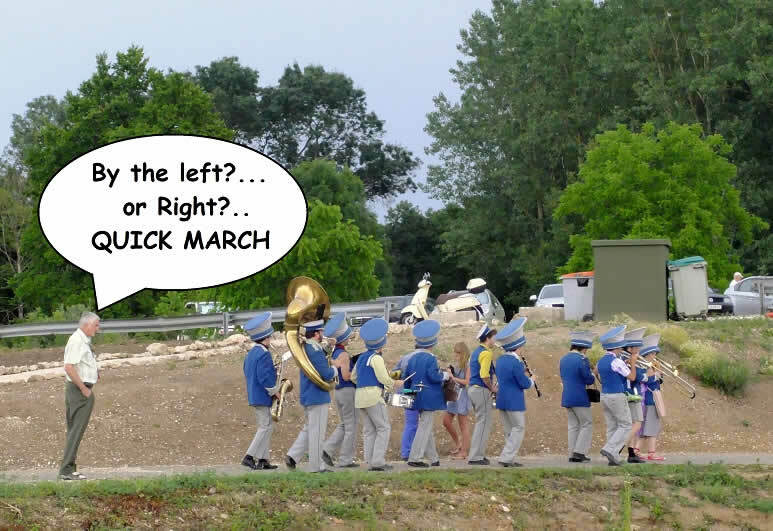 I suppose you are all now wondering if I was able to give Noel directions? Well of course I was. 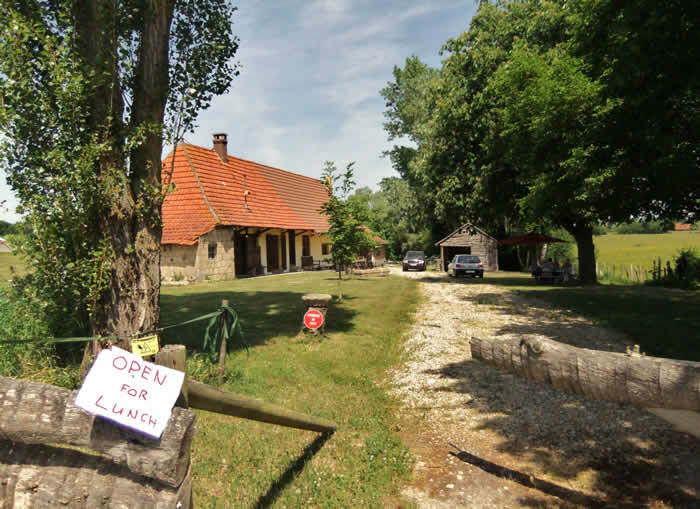 He was looking for a famous restaurant which is only about 2 villages away and about 5 minutes by car. Lets hope that Noel and his wife enjoyed their meal!! Well that's all for now folks, as there is lots of painting to do. But the weather will have to cool down a bit first as it's 5:30 pm and 31 degrees C. Let's hope it looks good on the next update!